An hour of high-octane action in the Med! 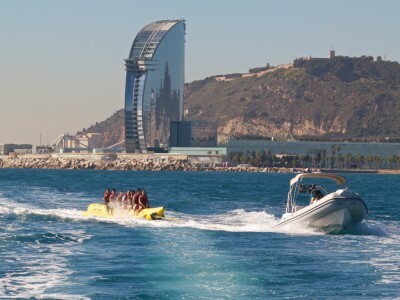 Are you and the other girls finding it difficult to choose between the incredible power and adrenaline of a speed boat ride, or a fun-filled, hilarious banana boat ride? Why not combine them both?! With this package you can satisfy your desire for both the cool and the crazy. For 45 minutes you’ll conquer the waves of the Mediterranean on a speed boat, a-la Lara Croft, before spending 15 minutes on a crazy, group banana boat ride! Everyone is a winner with this combo! We take care the boring stuff for you; insurance, safety equipment and fuel and mooring charges are included in the price. You just have to focus on not falling in the sea! Don’t forget to being along a towel, swimsuit and sunscreen!